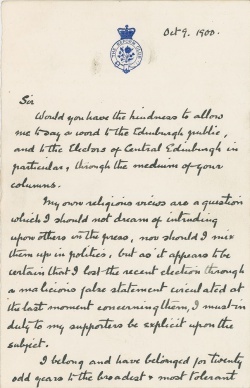 This 4-page letter was written by Arthur Conan Doyle on 9 october 1900 and sent to the editor of The Scotsman newspaper. 4,5 x 7. Representing the Liberal Unionist party, Doyle ran for Parliament in the 1900 Edinburgh Central general election against his former publisher, George Mackenzie Brown of the Thomas Nelson and Sons publishing company. Doyle was defeated, and was quick to condemn a libelous placard posted throughout the district on Election Day, one proclaiming him to be an agent of the Catholic faith. Would you have the kindness to allow me to say a word to the Edinburgh public, and to the Electors of Central Edinburgh in particular, through the medium of your columns. 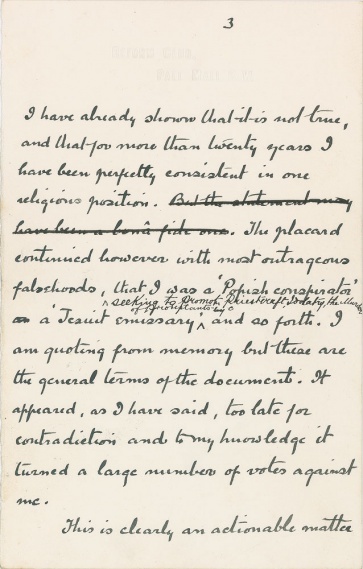 My own religious views are a question which I should not dream of intruding upon others on the press, nor should I mix them up in politics, but as it appears to be certain that I lost the recent election through a malicious false statement circulated at the last moment concerning them, I must in duty to my supporters be explicit upon the subject. I belong and have belonged for twenty odd years to the broadest & most tolerant section of the Church of England. I have written years ago a book called "The Stark Munro Letters" where in the form of a thinly veiled autobiography I discard my own religious position. I have sittings in the Swallow Street Church in London, and the man who sits under Mr. Voysey cannot be accused of bigotry or intolerance. Such in brief is my religious position. Late on the night Immediately before the Election there appeared a most infamous placard, 300 copies of which were posted upon the walls of the Central Division, which undoubtedly did me great harm. It declared that I was a Roman Catholic, which was not true, unnatural as my family have been closely identified with that faith, and I was myself brought up at a Catholic school. I have already shown that it is not true, and that for more than twenty years I have been perfectly consistent in one religious position. But the statement may have been a bona fide one. 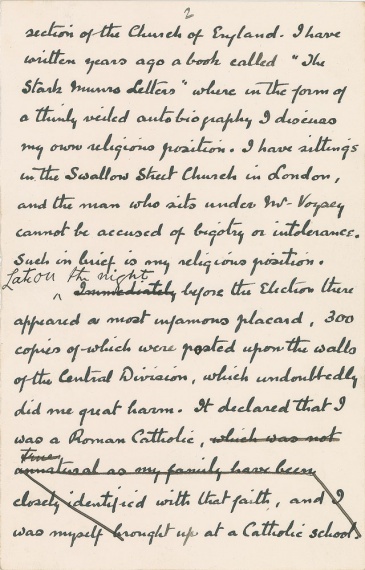 The placard continued however with most outrageous falsehoods, that I was a 'Popish conspirator' a 'Jesuit emissary' seeking to promote Priestcraft, Idolatry, the Murder of the Protestants, and so forth. I am quoting from memory but these are the general terms of the document. It appeared, as I have said, too late for contradiction and to my knowledge it turned a large number of votes against me. This is clearly an actionable matter for if a malicious lies may be launched against a candidate at the last moment we shall bring our elections down to a Transatlantic level. 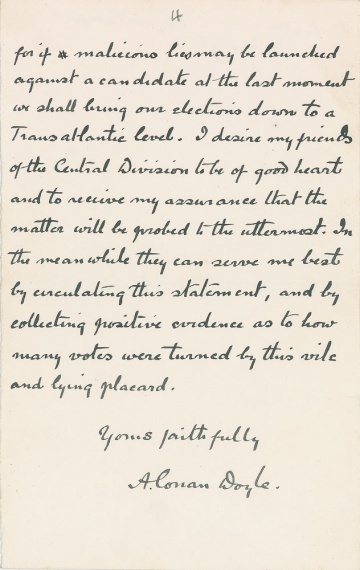 I desire my friends of the Central Division to be of good heart and to receive my assurance that the matter will be probed to the uttermost. In the meanwhile they can serve me best by circulating this statement, and by collecting positive evidence as to how many votes were turned by this vile and lying placard. This page was last edited on 18 February 2016, at 13:17.